100 lbs in 7 Month Winner! Here they are, Haley’s amazing 150 lbs gone and goal photos. Losing 150 lbs in 14 months is no easy matter. Yes, our diet will help anyone do it, but the truth is, it takes a clear desire, a want, that many just give up on. Haley doubted it many times, she thought: I’m sick of dieting, I’m sick of weighing, I just want to be normal! There were a few times she just skimmed by on weight loss to continue her free status at camp after winning the 100 lb challenge. There were times she just broke and completely ate off plan. Oh, no, are you disappointed she wasn’t perfect? Don’t be. In all of our minds, dieting is temporary. The day to day of dieting for 14 months straight is tough. So how did she do it? Haley never gave up. Yes, she wanted to, many times, but she never did. She would get back up each and every time, ask for support, talk about how she was feeling, how overwhelmed she felt at times, how sick and tired she was of dieting. Then she would take a deep breath, get back on her plan, and push through. Haley wanted this. She wanted to be a runner, an active mom, a woman who could be proud of what she had done. It didn’t matter how much her fat brain tried to convince her she didn’t really want this or even that she was incapable of getting it, she knew in her heart what she wanted, so she fought, sometimes tooth and nail, and finished this off. Everyone at camp who watched this transformation is in awe of her strength, her perseverance, and her dedication to herself. Thank you so much everyone! I really appreciate all of your lovely comments Everyone here is so capable of doing this. I am so not special in any way, shape or form. I struggled so many times because it is very hard to change habits and behaviors that you have had for so long. But really, that’s all it is, just working hard to change all those bad habits we’ve had for years and years. Just keep doing the work, every day, and the change will start to happen. Your brain will start to accept that this is the new you, and it will get easier and easier with each passing day, and before you know it, you will be at your goal weight too! I am rooting for every single one of you! Here is something TinaBee wrote to her in the B&A section at camp. It is basically the theme of all the comments. I have been waiting with baited breath to see these B&A’s of yours, Haley! Not only have you climbed Mt. Everest, but you put a big flag on top! You have reminded everyone that if we are willing to believe in ourselves and push past our Fat Brain comfort zones….. ALL things are possible! Thank you for sharing your continuing journey with us! You are truly the definition of an inspiration! Haley has inspired us all to look at our dreams, our goals, and even when things ahead look scary and uncertain, to know that if we don’t give up. If we just keep fighting, we can all do as Haley has done: Be the woman we dreamed of for so many years of our lives. When you look at these photos take into account that the perspective in the before and afters are the same, so is the pixel width of each comparison. Note in all of the photos, how much less space our beautiful Haley now occupies. If anyone would have told me a year ago that I would be 150 pounds lighter in one year, I would have laughed in their face! A year ago I weighed almost 300 pounds, and I was pretty much at rock bottom. I had struggled with my weight my entire life. I had tried countless times to lose weight, but I just couldn’t make the changes I needed to make to be successful, and I just kept getting heavier and heavier. I cried every day. I was very unhappy, and very depressed. I couldn’t play with my kids the way they wanted me to, it was hard for me to get myself out of bed in the morning. My thyroid was messed up, I had sleep apnea, horrible depression, and I just wanted to give up on life. I had seen some before and after photos on Pinterest from some women at RFBC about a year and a half earlier, and I was so inspired by them, but I didn’t think I could ever do anything that hard. It seemed so drastic! But I just kept coming back to the website to look at the pictures, wishing that I could be those women who had had such wonderful success. In June of 2014 I had my fourth child, and eight months later in February of 2015, I was still wearing my plus size maternity clothes and even they were getting too tight. I had had enough, and I was at the point where I didn’t care what I had to do, I was done being fat. So I signed up for RFBC, and one year later I weigh 138 pounds! It wasn’t easy. I struggled a lot because let’s face it, change is hard, and I was battling years and years of bad habits and behaviors with food. But the support that I got from Carlene and the other ladies at camp were exactly what I needed to keep going. I had to put in a lot of hard work, but it was the best thing I have ever done for myself. I weigh less than I weighed in high school. I have SO much energy. I used to wonder how it would feel to be a person who could get through the day without a two hour nap. Now I know! I’m hardly ever tired, my thyroid medication has been dramatically reduced, I no longer have sleep apnea, and my depression is totally gone. I am able to play with my kids every day, and we are enjoying being more active together as a family. I have also started to run every day, and am training for a half marathon in June, and am planning to run a marathon next year, which has been a dream of mine for years. I didn’t just get weight loss from joining RFBC. By listening to the daily audios from Carlene, and by participating in the discussions and support groups at camp, I have been able to take HUGE steps in changing my habits and my attitudes toward food. I have no desire to return to the way I ate before joining camp. I am enjoying my healthy lifestyle, and I am enjoying finally being happy and at peace in my life. And I am enjoying being SKINNY!!!!! Haley hits 140 lbs Gone in One Year! 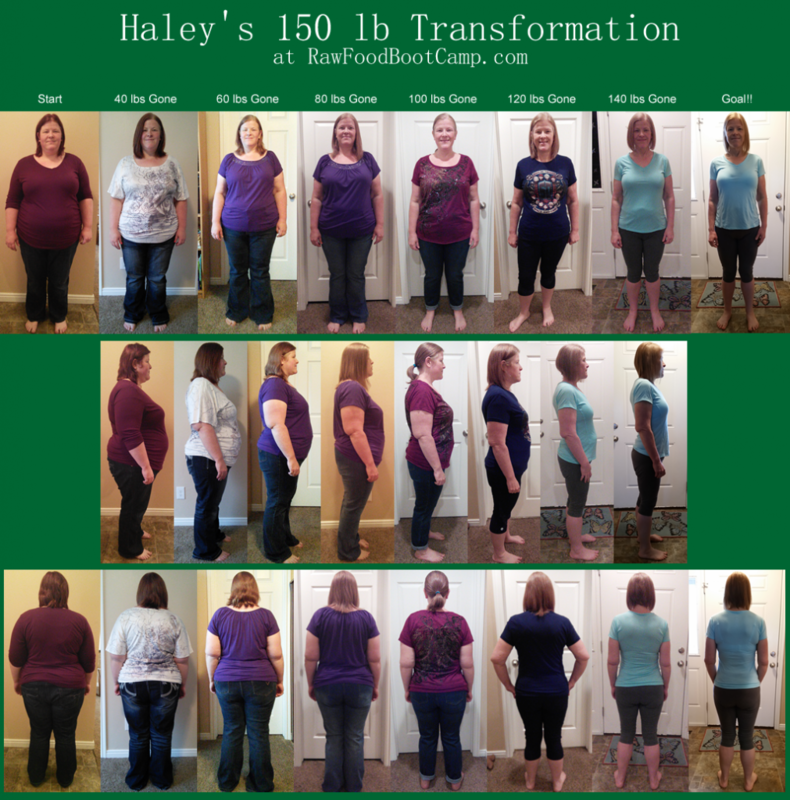 On Wednesday, when I put up Haley’s 140 lbs gone before and afters at camp, members kept coming back to the discussion thread to look again, and again, jaws dropped, eyes wide with grand inspiration. I would love to tell you that Haley just focused and ran through her weight loss journey, but that wasn’t the case. She won our 100 lbs in 7 months challenge, then lost her momentum. She wanted to be done, and the idea of having to lose 47 more pounds seemed overwhelming. Well, check out her photos and read what she had to say to all of us who were in awe of her great success. Wow, thank you SO much everyone Your comments have totally made my day! I’ve said this before and I’ll say it a thousand times, choosing to join RFBC was absolutely, 100%, the best choice I have ever made in my life. I believe with all of my heart that I could never have done this anywhere else, and I will be forever and always grateful to every single person here for being with me and supporting me on this CRAZY, HARD, but AWESOME journey. I have had some very difficult times when I have almost given up and quit because for some reason or another I felt like it was just too hard, times when I felt like I was hanging on by a thread, but I just kept hanging on, I never let go, and it is so hard to believe that I have lost this much weight in a year. If anyone had told me a year ago that I would be here today I would have laughed in their face. I absolutely love my new body. I still have some things I want to work on. I still need to lose a few more pounds and then I want to work on getting stronger, but I am well on my way to having the strong, fit body I have always wanted. I seriously feel like now the sky is the limit Every part of my life has been made better because of this diet, the walking, and all of the things I have learned at RFBC. I started RFBC wearing size 3x in tops and a size 26 in bottoms. Today I went shopping and I was able to buy a size 9/10 in jeans and size medium tops, and I even bought one size small This is absolutely crazy to me! I NEVER would have thought this possible, EVER! But here I am. Never give up ladies. If I had one piece of advice to give it would be just never give up on yourself. I am not special or different than anyone else. If I can do this, anyone can. Also, Carlene, you are my hero and I never could have done any of this without you. You saved my life. Well, actually, Haley saved her own life. We guide, we encourage, we listen, but in the end, Haley did this for herself. And we are so very proud of her. I hope you are too. Haley Hits 130 lbs Gone in 10.75 Months! Haley started RFBC on Feb 2nd of 2015. Today, she is 130 lbs lighter. She has 15 lbs left to goal. Imagine that. Imagine you, next Christmas 130 lbs light, or even 150 lbs light, or for those with less to lose at goal! This happens at RFBC, if you work our program and don’t give up. Even Haley at times wanted to give up, but she didn’t and now look at her. We are all so proud of her, as I’m sure those who have watched her are too. Congratulations Haley. Job well done! Haley did our Rawk Starz diet with 2 hours of walking a day to lose 130 lbs in ten months. To finish up her weight loss, for 2016 she is switching to our Wholy Rawker diet and adding toning to her daily routine as she prepares to make her way to a life long maintenance plan. Thank you so much everyone I seriously really appreciate all of your really nice comments! It is so weird to hear people call me skinny and tiny, hahaha. I see and feel the difference for sure, but it is still a little hard to believe that people are saying that about me! But I also love it This is so worth it you guys. I am just so glad that I did this, joining RFBC was seriously the best thing I ever did for myself. I look at my before pictures and I remember how horrible I felt, and I never want to feel that way again. EVER! Sticking with this, even through the struggles is just so worth it. NEVER give up! Look at Haley!! Wow. Just 25 lbs to go before goal and she is determined to see it this year. We are all so very proud of her. She never believed she could do this. Even the other day, she questioned this, but then she realized she has done this. That 25 lbs more is nothing in the scheme of things. She will see this all the way to the end. You have to agree, she looks awesome already! See that t-shirt she has on? It was a gift from her husband a long time ago for a favorite show they shared. He ordered it on-line thinking it was the right size, but when it arrived it was more kid sized than adult sized, so they both knew while Haley loved it, she would never be able to wear it. But, she kept it because of all the thought and love that went into it. For a kick, she decided to try it on the other day. And it fit. This was huge for her. When she’s at goal, the t-shirt will be too big. Haley Hits 110 lbs Gone! Haley thought she was in that winner slump I talk about in the 100 lb Challenge rules, but she hasn’t. Here she is at 110 lbs gone, and heading to goal by the end of the year. She did have one little hiccup along the way, but overall, she has fought so many insecurities about whether she could accomplish this or not. Now I think she is starting to settle into this new her. The change is so dramatic. Those jeans on her that look so baggy, she just bought them a week ago and now they are too big. Haley is now in the fun side of all this. CJane told her about it. It’s when every ten pounds gives you a new dress size, when shopping becomes so much fun, when you look in the mirror and daily see the difference. We are all so excited for her and are looking forward to her big goal win of the year! Haley does our Rawk Starz Diet with 2 hours of Walking a Day. She is a 100 lbs in 7 Month Champ at Camp! Wow, 100 lbs gone. In 7 Months. On Wednesday Sept 2, Haley will win our 100 lbs in 7 month challenge, get her $500 Visa Card, be awarded her 4 Free weeks of camp, a coupon for $100 off her next paid for membership, and have the opportunity to earn free membership every 4 weeks by just losing 6 lbs each 4 weeks. We’re going to push so she never has to pay for camp again!! Haley prompted some big discussions at camp this past week, as it hit her that even with 100 lbs gone she wasn’t done yet. It always feels like such a battle won when you hit such a huge milestone. But then the idea that there isn’t time to take a breath, that you have to keep going can feel overwhelming. But, we have women at camp who have been there, who have felt the same way, overcame and were more than happy to share that insight and support to push Haley past those thoughts and back into get this done mode. When Haley sent me her photos today, she worried there was no change, but once she received her collage, she was very happy, as was I to see such a big difference in these last ten pounds. Wow, she looks great. I think as you look at this amazing difference these 100 lbs gone make you’ll see what our diet does. She looks so much younger, so much healthier, not just in her weight, but in her skin and her smile. And those jeans. Size 16’s. CJane told her that after those first hundred are gone all the fun begins as her body takes shape, her clothes size drop faster than she could imagine, and the toning begins. You can already see that Haley is going to look amazing when she’s done. Losing 100 lbs is hard work, fighting through all the doubts and fears, can feel overwhelming, but as Haley has proven, if you come to camp and ask for support, you will find that there is always someone around who has been in your shoes, knows how you feel, and can help you through. This is why we love RFBC! Haley hits 90 lbs Gone in 6 Months – Fast Weight Loss with a Raw Food Diet! Wow, Haley is rawking the 100 lb Challenge. She is set to win the 7 month challenge on Sept 2nd. We’ve been seeing her a lot lately in these before and afters. We do them in 10 lb increments, and her last 30 lbs have just melted. Haley has stepped up as a leader in her challenge group and daily inspires others going after these challenges. She still has doubts here and there, but they are becoming weak whispers that have no affect on her ability to stay on plan. I talked earlier about embracing change, about stepping up and courageously putting yourself somewhere you doubt you belong. Haley is a true hero in my eyes for doing just that each and ever day. She proves to us all that this is possible, that want can be bigger than doubt, and then she turns around and hands that courage to others as they make their way through their journey. Thanks Haley for being part of RFBC and proving to the world that everyone can do this if they want it. I know, you just saw Haley’s 70 lbs gone photos a couple of weeks ago. She is on such a role. In September she will win our 100 lbs in 7 Months Challenge. There’s no stopping her now!! If you fear you can’t lose the weight, if have ever thought this could never happen to you, or even if you had the courage to do it, then look to Haley. She has struggled greatly with her belief in her ability to want and do this, yet with all that struggle, she keeps to her plan, she gets her exercise in and she loses the weight. And I must say, she does it beautifully. I think Haley can teach everyone that courage doesn’t come from physical strength, it doesn’t come from bravado, it comes from the heart. You want it, you need it, you do it, regardless of what your brain is screaming at you. Man, everyday, I am inspired by Haley. If you ever thought you couldn’t do this, that you didn’t have what it takes to do this, you pull up Haley’s before and afters, and you confidently say: Haley did this, and so can I! See her as the guiding light to your own success. She already looks 20 years younger, doesn’t she? On July 17th, Haley hit 70 lbs gone, as of today, she has lost over 75 lbs. She is doing our 100 lbs in 7 Months Challenge, and at the rate she’s going, there’s no doubt she’ll make it. This hasn’t always been easy for her. She’s had her doubts, her fears that she won’t be able to take this all the way. That with more than 100 lbs to lose, that somehow it won’t happen for her like it has for others. But, while she feels these fears, she doesn’t give into them. I have always been proud of her for that. With so many of her big winner predecessors moving into our maintenance area, Haley is finding, she is now the one inspiring others, the one others look up to and think, wow, if Haley can do this, then I can too. I am a big Haley fan. The major reason is because this has not been easy for her. Her fat brain has fought her at every corner, and while those doubts linger, she never gives into them. She acknowledges them, she lets them get to her emotionally, but she doesn’t feed them. And not feeding emotions is huge for all of us. I know I speak for all of us, when I say: Haley we are so proud of you and can’t wait to see all that you will accomplish. We are all so proud of Haley. Last week she hit 50 lbs gone in 12 Weeks to win 4 free weeks of camp and the ability to earn 4 more for losing another 12 pounds in 4 weeks. But, on top of that, she qualified for the 100 lbs in 7 Months Challenge. Pretty cool right? Doubts still seem to get to her at times, but even though she struggles in her mind about how possible this really is for her, she doesn’t let that convince her to break her program. She is a diva, indeed! Big time kudos, Haley from all of us who watch you fight the fears and still persevere! Isn’t it amazing how our diet takes years off a face. Look at her, she looks 20 years younger! Way to go, Haley!